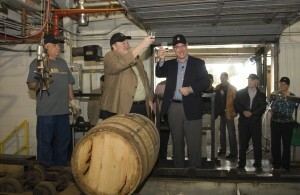 BourbonBlog.com first reported that Knob Creek ran short this summer, due to high consumer demand. We even visited the Knob Creek House in Clermont during the drought in our episode on this link. 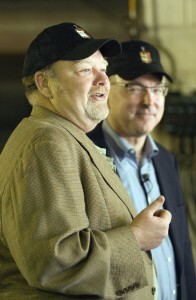 Rather than rush production, Knob Creek tells BourbonBlog.com stayed true to the ideals and standards of its originator, the late Booker Noe — Fred Noe’s father, and grandson of Jim Beam – and let this batch, barreled in 2000, reach its full potential. While some Knob Creek fans may have recently run short on their favorite Bourbon, they didn’t go wanting for information about the reasons why. Direct communication to the brand’s thousands of Stillhouse members, and advertising in major media like The Wall Street Journal and The New York Times, explained the shortage. The reasons for it were deeply explored in a live webcast we broadcasted the stream of on BourbonBlog.com in September — a first for Knob Creek — where the brand’s resident experts, the Whiskey Professors, answered fan questions about the drought, and the finer points of fine Bourbon craftsmanship.